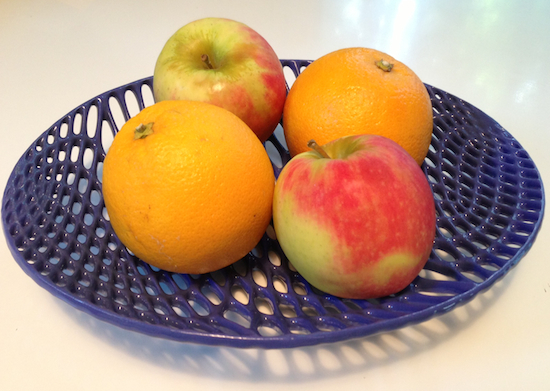 This ceramic fruit bowl showed up at the Globe recently, addressed to me. It's a product sample sent by Figulo, a South Boston company. And it's the first 3D printed item I've seen that I could imagine using in my daily life... as opposed to chalky, fragile prototypes or "toys" that only last if they're kept on a shelf. I called Figulo founder Andy Jeffery to ask him about the bowl. "It was designed by an architect at UC Berkeley that we're working with, Ronald Rael, who runs a site called Emerging Objects," Jeffery told me. "The piece was just a cool little design study of his. We print it on our hot-rodded Z Corp. printers. We have six of those here. We made some modifications to them so that they can print ceramic." (Z Corp. was an MIT spin-out that is now owned by industry giant 3DSystems.) An inkjet printer head in the 3D printer spits out a special powder formulated by Figulo, which includes a solid glue. Then, it adds a water-based fluid that "dissolves the glue and binds the joints of the ceramic particles together," Jeffery explains. The printer head builds the object one layer at a time, resulting in a green ceramic piece. "Then we blow away all the loose powder with compressed air. It gets fired in one of our kilns, then we glaze it and fire it again, so it's food safe. We don't claim it's microwaveable or dishwasher safe." Jeffery says the bowl he sent takes about 2 hours for his printer to produce, but then "a day for firing and another day for glazing. If we get an order on Monday, we can ship it on Friday." 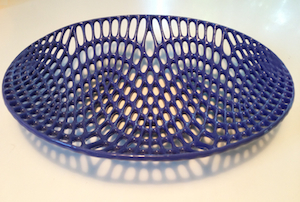 Orders come through 3D printing sites like Shapeways and Cubify. Jeffery says that Figulo, founded in 2011, is the only vendor making finished ceramic pieces on a 3D printer: "We've got the field to ourselves for the moment." In addition to cranking out consumer products, he also makes the occasional piece for industrial or government customers like NASA. "But we think there's more money in non-technical markets." The company has five employees. He expects that Figulo-produced items may soon start showing up in more local design stores. "We trying to look at whether we could do something at an outlet like Home Depot, too, letting people design their own tiles with high relief printing," he says. "People are drawn to these objects," Jeffery says. "They don't believe that they were 3D printed."